Back to the issue at hand. The condition overall is very nice. Nice cover, quite clean though you can see some slight browning around the cover. This is accentuated by the lighting I’ve got here, it’s not as noticeable in actual fact. Nice overall and a good first impression. As expected, the cloth is nice with the dust jacket removed. Very clean, no issues at all. Well, some slight bruising at the head and tail, but not affecting the condition of the book. 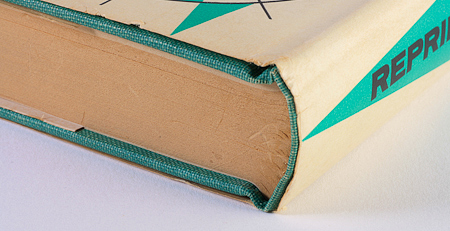 With a closer look at these points, we can see the excellent condition of the jacket and the binding. Some slight browning of the block and we get a glimpse of an unusual feature of this particular copy. Let’s pull back a little. Very nice, a hint of a roll at the top of the spine. Can’t quite see that ususual feature here so let’s get closer again. This copy was evidently bound with two different grades of paper. The majority of the block has discolored more rapidly than the first signature there. The back looks slightly discolored, but as for the front, it’s emphasized by the lighting here. 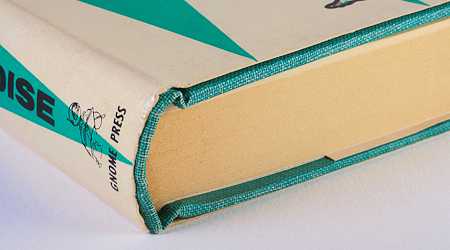 Binding: Green cloth with deep red lettering on the spine. 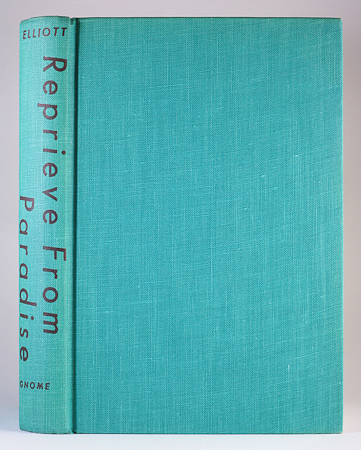 Chalker & Owings: REPRIEVE FROM PARADISE, by H. Chandler Elliott, 1955, pp.256, $3.00. 4000 copies printed. Jacket by Mel Hunter. Comments: In a nice solid condition. Interesting tidbit with the two grades of paper used in binding this copy. 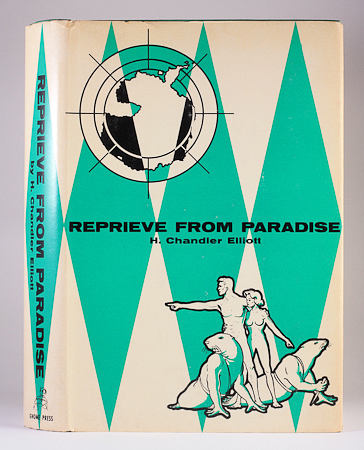 Reprieve from Paradise by H. Chandler Elliot arrived today. I’m very happy with it. 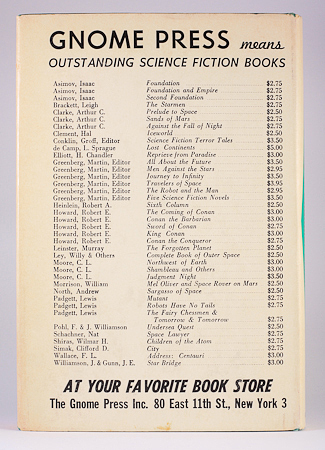 Looks better than it did in auction to tell the truth – an NF copy. Got another title that should be here in the next couple of days too, and I have my eye on another couple on eBay at the moment too.